The Lady Eagles may be the No. 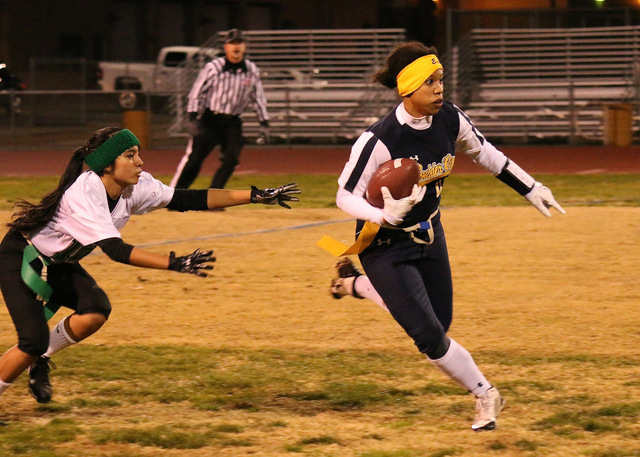 2 ranked girls flag football team in Southern Nevada, but they are No. 1 when it comes to collecting and donating toys. Boulder City defeated Eldorado 33-6 on the road Friday to improve its Sunrise League record to 5-0. The Lady Eagles are 7-0 overall and ranked No. 2 in the county among 34 schools in the Las Vegas Review-Journal’s Dec. 21 poll of Southern Nevada coaches. 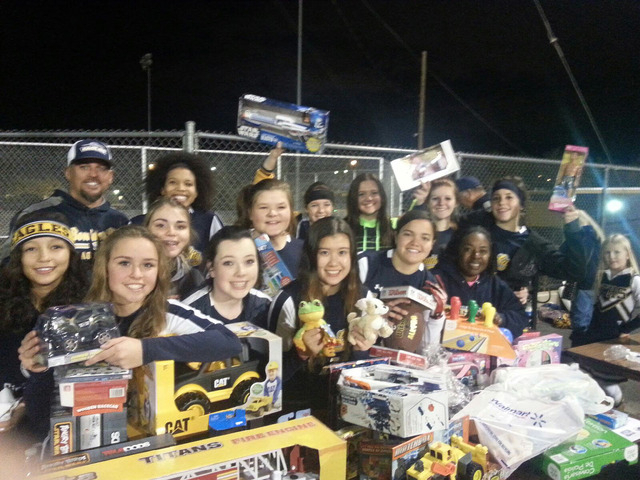 But in the coaches’ challenge to collect toys for 98.5 KLUC’s 16th annual toy drive, the Lady Eagles were No. 1 in the county, raising more than $1,500 in unwrapped toys and gifts cards. The Lady Eagles have been pretty awesome on the field, too. They have won 25 consecutive regular season games dating to last season. Against Eldorado, Jeanne Carmell threw three touchdown passes and ran for one. She completed 13 of 23 passes for 131 yards and threw two scoring passes to Kinsey Smyth and one to Mackenzie Pluta. Carmell also rushed for 76 yards and one touchdown on three carries for the Eagles, who also got a touchdown run from Paige Buettner. The victory attained a milestone for the Lady Eagles in that they were not beaten in a regular season game in the calendar year of 2014. During 2014 they were 27-1, having also won two playoff games and losing the Sunrise Region championship. There was no change atop the Southern Nevada flag football coaches poll for the week of Dec. 21. Boulder City remained No. 2 in the county behind Cimarron-Memorial. Boulder City has two weeks off for the holiday break and returns to game action at home against Basic (4-3, 3-2) Jan. 5 for the first of three consecutive games against larger schools. They play Jan. 7 at Foothill (9-1, 6-0) and at home Jan. 9 against Green Valley (9-0, 5-0). On Dec. 17, Carmell threw three touchdown passes to Smyth as the Lady Eagles defeated Rancho 27-0 to record their third defensive shutout in five games. The defense was led by linebackers Logan Kanaley, who made a game-high nine tackles, and Oshanna Remy, who had three tackles and one interception. Pluta made three tackles. As a safety, Smyth made two interceptions. Carmell completed 18 of 24 passes for 198 yards, while Smyth made six receptions for 95 yards. Remy caught eight passes for 59 yards. Buettner added one rushing touchdown and gained 23 yards on four carries. Carmell rushed for 48 yards on four attempts.